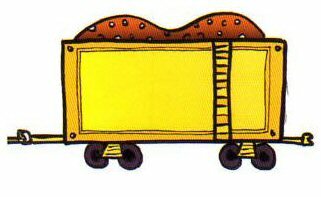 Drawing a modern train is a bit like drawing a truck. It’s made up of lots of rectangles and circles. 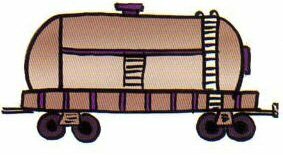 Let’s start with an ordinary passenger train then look at how we can turn this into lots of different types of train. Draw a long rectangle. Now draw three pairs of circles along the bottom to make wheels. Put a smaller circle inside each of the circles you’ve already drawn. Add some little rectangles to make windows and doors. Your train won’t be going anywhere without the driver’s carnage. This time instead of drawing a rectangle draw a more curvy shape like this one. Let’s whizz on to drawing high-speed trains. 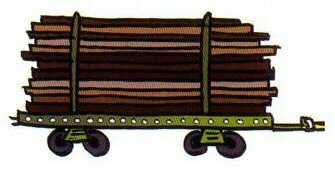 Trains carry all kinds of loads in different types of containers – here are some you could draw. 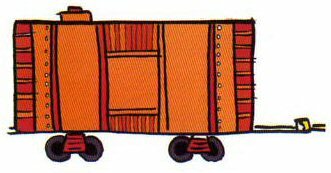 Draw a giant sausage to make a cylinder shaped tank. Pile lots of thin rectangles on top of each other to make planks of timber. The straps holding them on look like long skinny fingers. of tiny circles for the little stones. 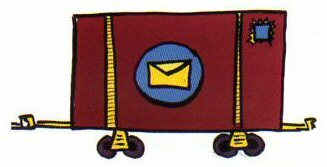 Make a mail truck by drawing an envelope and a stamp on your rectangle instead. To draw a busy train put some people in the windows – draw stick people if you want.